In many way the modern West is the most advanced civilization in history. There's one field, however, in which I'd have to rate it just about last among historic cultures: men's clothing. Has there ever been a more cumbersome and more determinedly uncomfortable set of garments? Almost every part of the body is enclosed, usually fairly tightly. Trousers, shoes, and shirts all have to be hauled on separately, often with some effort -- has there ever been a greater absurdity than the shoehorn? -- and if it doesn't take effort, they're probably too loose to look right or stay in place properly. Shirts have to be buttoned up (why did zippers never catch on for shirts as they did for trousers or jackets?) and many shoes still need to be secured by tying laces into a peculiar and silly-looking sort of bow-knot. The whole ensemble is fussy, awkward, and over-complicated. After all that, you're not comfortable. A change of posture as simple as sitting down can cause constriction of the groin, waist, or even armpits. If it's warm, no comforting breeze can reach most of you. Why are smelly feet so common a problem as to be an occasional staple of jokes? That's what a day's worth of tightly-trapped sweat will do. Absorbent socks mitigate the problem, at the price of one more tight, silly-looking item to deal with when dressing. The fact that modern clothes are fairly tight, and have to be in order to look right or stay on properly, means that you have to buy new versions of everything if you gain or lose a substantial amount of weight -- often a non-trivial expense. And don't even get me started on the necktie. This utterly non-functional symbol of conformity has always put me in mind of a leash. It's one more otherwise-useless knot to learn, it takes some practice to get it to look right, and it requires a fairly tight collar -- one more point of constriction. It is, thank goodness, seemingly on the way out. During the last Presidential election I recall seeing both Obama and Romney at at least some campaign events without ties, and nowadays, if you're in a typical office and you see a man wearing a tie, it's usually either the president of the company or a temp worker on his first day on the job. What alternatives can history suggest? As is so often the case, we could learn a thing or two from the ancient Greeks. The clothing depicted in Greek art or statues may look elaborate, but in fact most garments in that culture were variations on a simple large sheet wrapped very loosely around the body below the armpits, with the front and back pulled up and pinned together over one or both shoulders. For fancier effects one could add sleeves, or a sort of sash over one shoulder, across the opposite hip, and up the back to the shoulder again and pinned in place, or even a cape. In most cases getting dressed or undressed took probably a couple of minutes. 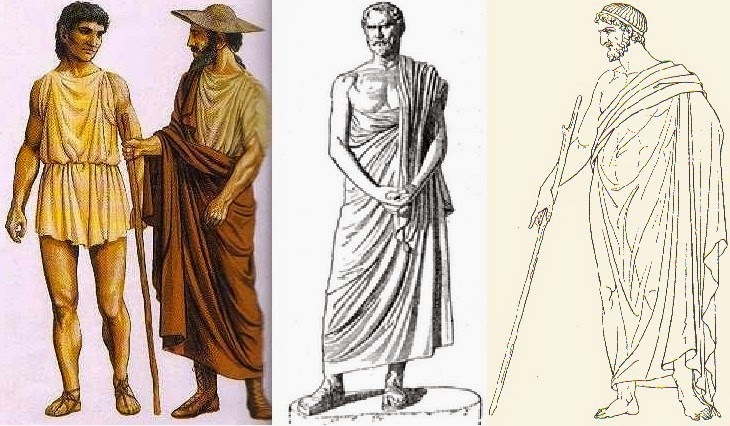 Contrary to modern impressions, these simple clothes were usually brilliantly colored, in contrast to the drab palette favored for male clothing today. With our far superior modern ranges of fabrics and fasteners, such clothes could be made even easier to handle and more esthetically pleasing. Winter in some parts of our country would require something different, but even in those regions, Mediterranean-inspired garb would be well suited to the summer. But, of course, this will never happen. Our standards and concepts of what looks right and, perhaps more important, of what looks masculine have changed too much, and many of today's flabbier specimens could hardly carry off a look that evolved for bodies toned by the ancient Greek emphasis on athletics. For the foreseeable future, we're stuck with what we have. Normally I am in agreement with your ideas, but this one, and I can't emphasize enough, is brilliant, genius, and ought to be required reading in our schools. Long ago I used to have a suit and tie job, but left it 30 years ago. I have only worn a tie twice since then, for my parents' funerals. How happy can a person be if they are not physically comfortable? Here in the north I think a fleece lined winter toga would be terrific! Jono: High praise indeed, thanks! I've been writing this post in my head for a long time -- every time I have to get dressed, in fact, ever since learning how much better the clothing in Classical times was. Love the fleece-lined toga idea. Here in the almost Arctic Circle of the Northeast, a toga-like garment wouldn't work for our cold seasons (which begin around October 1 and end around May 1. But I'm in total agreement with wearing comfortably loose clothing made of soft, non-itchy fabrics. I rarely see a suit and tie outfit on the young men who live in my neighborhood and work in downtown Boston. It's an exception to see someone dressed like Don Draper. And the same is true of the young women who live and work here. The order of the day is casual. Even in the frigid heart of winter, you can see young women walking to work in short skirts and no stockings on their legs! Brrrrr. I don't understand that, but perhaps they're more inured to the cold than others. Casual and comfortable has taken over the world, I think. Toga! Toga! Toga! (Sorry, I know togas are Roman but I couldn't resist the opportunity to quote Animal House). At any rate, as someone of Greek heritage I applaud your idea. Men's clothes really do seem kind of awful, and there's also very little choice. Women can wear dresses, skirts, pants, jumpers, ect., but men can't. That said, have you ever tried high heels? They deform women's feet! Shaw: I do hope society continues moving in that direction. Here in Oregon stockings seem practically extinct. Nina: Yes, it's frustrating that women have so much wider a range of options than we do. I truly envy many of those -- but not high heels. They look terribly uncomfortable, just as men's clothes are, and downright dangerous when climbing stairs. And I'm not sure how women were convinced that they're attractive to men. Honestly, we'd rather you just felt OK with being a few inches shorter than we are, and let your feet be comfortable. I have to say that reading this reminds me of something mentioned in Crichton's TIMELINE--that we wore more pieces when it came to modern clothing--20-something pieces or so--whereas in the Medieval period the average person only wore around six pieces or so. I agree, but only partly. Ties are the work of Satan. But if you work around machines, togas really don't work either. You don't want to offer a high-power device an opportunity to grab hold and do with you what it will. I usually wear a pair of slacks, a knit polo shirt, and a pair of running shoes. Lightweight, breathable, comfortable, and best of all, able to exit the area muy pronto if something goes cubist. Tim: true, some specialized occupations require specialized clothing, and that would be true regardless of what the normal everyday dress was like. Heh, this is a subject I could probably write an essay on myself! I've long felt the way you do regarding the impracticality of Western men's dress - it really is one of the few areas where other cultures would do well not to emulate us! (It's pretty absurd to see, for example, suits being adopted as everyday attire in a part of the world like sub-Saharan Africa*.) It's also one of those things that makes me wonder if we humans are really as intelligent as we think we are - why do we so often go out of our way to not only make ourselves needlessly uncomfortable, but also risk something like heatstroke?! (Of course, some folk would probably consider that the whole point ie the sort of testosterone-poisoned idiots who seem to think masculinity has to be all about self-inflicted pain and hardship.) Two cultures that still seem to exhibit a modicum of sanity in this area are those of West Africa (where men's clothing is not only loose and comfortable-looking, but often brightly coloured as well), and the Middle East (where the clothing may not be as flashy, but is still undeniably practical for a hot climate). In my own small way, I've been fighting this sort of sartorial foolishness myself. For example, I have quite a few unbifurcated garments in my wardrobe, among them a sarong, a couple of Utilikilts (one of which is great for summer), and some actual skirts. All get me the odd raised eyebrow when I wear them, but for the most part I haven't gotten too much crap (it probably helps that I try to project a confident attitude while wearing them). *This sort of silliness also has a venerable history in my own part of the world, where summer temperatures regularly exceed the century mark (if you're using the Fahrenheit scale) in large parts of the country. Not only have people here always emulated European styles of dress (despite their impracticality in many cases), but many of us engage in the added idiocy of celebrating Christmas the way those of you in the Northern Hemisphere do ie as if it's the middle of winter rather than summer (though that's another rant for another time). Heh, this is a subject I could probably write an essay on myself! I wish you would! I don't see how suits and ties are even doable in places like Sub-Saharan Africa or the Middle East except in the presence of air conditioning. I admire your braving those raised eyebrows. I doubt I would have the nerve, and if I showed up for work wearing a dress, I have a feeling the boss would make an issue of it. The refusal of colonizing populations to adapt to the climate in a new environment isn't limited to clothes. The effort to maintain English-style lawns and houses in southern California wastes a fortune in water and air conditioning, though I think lately houses in the thick-walled Spanish colonial style -- more practical for the climate -- are becoming more popular. I completely agree. The modern day Men Clothing is a disaster. People are so uncomfortable in their clothes that sometimes they lose focus on whatsoever they are performing. Video of the day -- Reich!